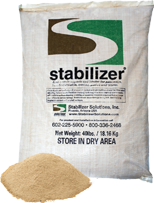 Stabilizer's natural soil binding allows you to use natural crushed stone with increased stability and strength, instead of concrete or fabric. Stabilizer Water Binding Technology strengthens these natural materials to withstand traffic, remain accessible, and resist the effects of weather. Made of 100% organic ingredients, our patented formula guarantees the same binding strength in the sweltering desert or the frozen tundra.